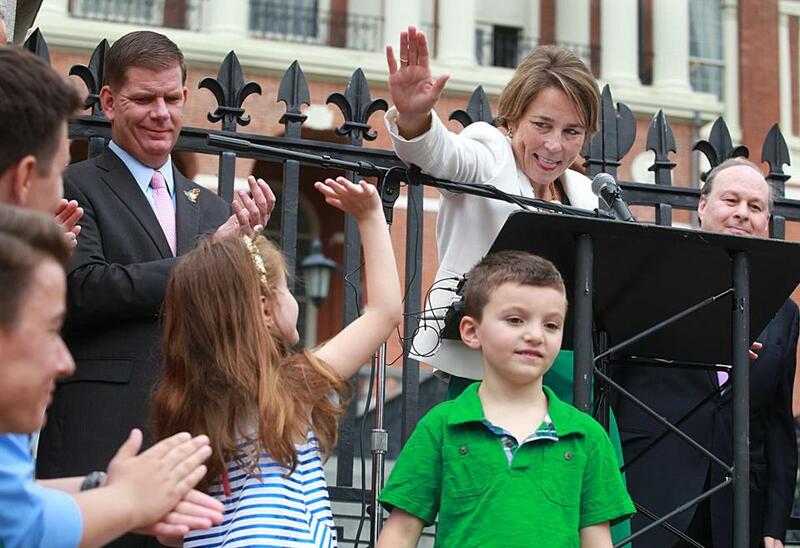 Attorney General Maura Healey gave a high five to Ella Lemay, whose brother, Jacob is transgender. 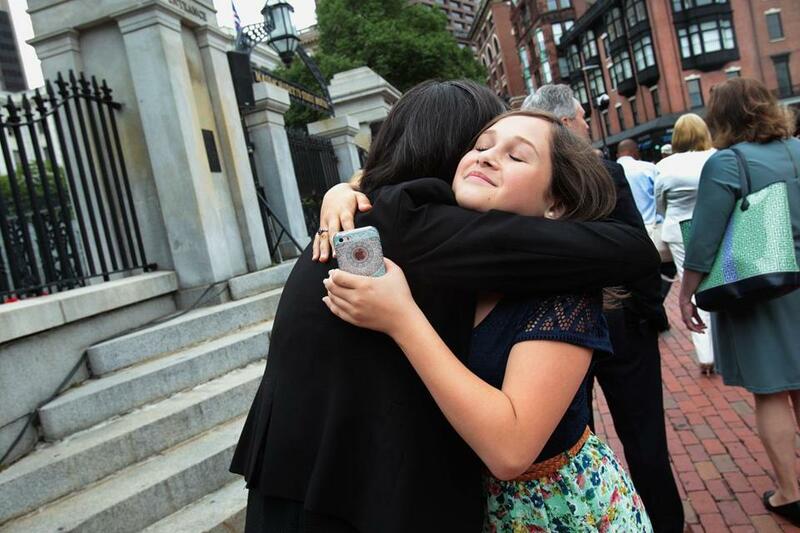 A gloomy morning did not dampen the celebration of Massachusetts’ new transgender accommodations law Monday, as more than 100 advocates joined top state legislators at the steps of the State House. Attorney General Maura Healey kicked off the ceremony, flanked by Boston Mayor J. Walsh, Senate President Stanley Rosenberg, and House Speaker Robert DeLeo. “This day is yours, and this bill is yours,” said state Senator Sonia Chang-Diaz, a Democrat from Boston and a lead proponent of the bill, beaming. Governor Charlie Baker, who signed the legislation into law Friday, did not attend. The new law will allow people to use restrooms, changing rooms, and locker rooms that match their gender identities. It will also protect transgender individuals from discrimination in public spaces such as museums, restaurants, malls, and libraries. The new law will go into effect Oct. 1, though one aspect — the prohibition of advertisements of signs that discriminate against transgender people — will be effective immediately. Several speakers, including legislators and advocates, took to the lecturn over the course of the hour-long ceremony to laud the law, which took nearly a decade to pass. While many decried how long it took the government to approve the law— similar bills had been filed but failed to make their way through the legislative process since at least 2007 — they said they were glad for the opportunity to gather publicly in support of the new law. “As the Senate president said, it puts us back on the forefront of quality on a global scale,” Walsh said. Many speakers called the moment historic. “I believe that these bills where we take a load off people, where we protect a group of people, these are the bills that we will look back on with the greatest pride,” said William Brownsberger, Senate chairman of the joint judiciary committee. At the end of the ceremony and after several people shared personal experiences, Healey invited attendees to sign an enlarged copy of the bill, and a crowd of transgender people and advocates rushed to the State House steps. Fourteen year old Nicole Talbot celebrated the bill signing.